Have you ever heard of a Scoodie before? No, it's not a scarf. No it's not a hoodie. It's actually a scarf and a hoodie in one! 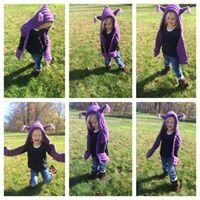 My oldest daughter has been wanting a Scoodie (although she didn't know this awesome name for it) for quite some time now. I finally was able to sit down and tackle this project. I already had a style in mind, so I decided to just create my own pattern for it. Her favorite animal is a puppy so that's what I decided to make her...and she LOVED IT! I made it with pockets, because my children are always loosing their mittens, and their little hands get so cold, so quickly. When I finished the main part of the Scoodie, I then created the ears to attach to it. My daughter tried it on and thought it was perfect. I, on the other hand, thought it was missing something. It seemed really plain to me so I decided to add the paw prints to it. 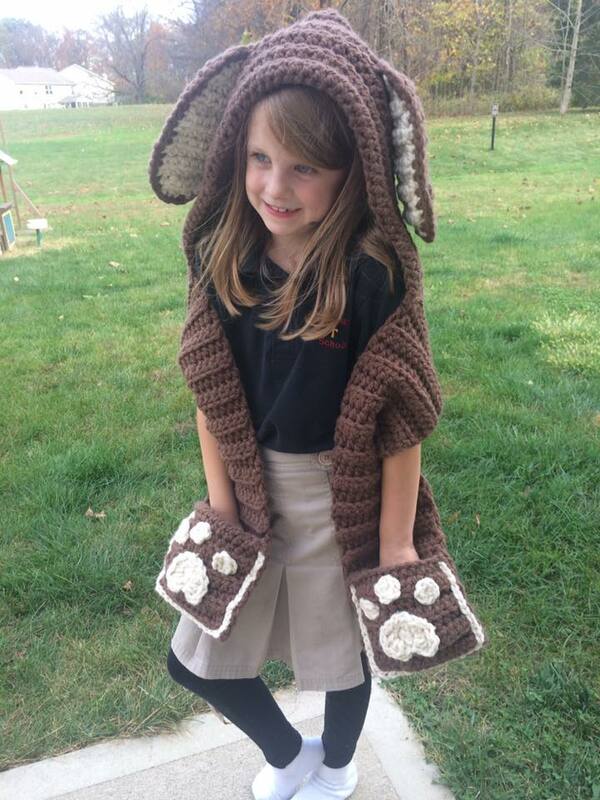 When I picked her up from school she saw it sitting in the front seat, because I crochet every chance I get, and she was thrilled! Now, not to be outdone by her sister, my youngest daughter wanted one as well, but this time an owl! Off to the store we went to choose her favorite yarn, of course it was purple, and I started on hers. She is smaller so I figured out the changes needed as I went. The owl Scoodie has less embellishments on it, but I feel that the simplicity of it makes it super cute still! Then it was time to take pictures. My oldest has become a pro when it comes to taking great pictures for Mom's work. I mean, she has it down pat. LOL, I call her my little child model. She knows when to look down, or to look off into the distance smiling and so on. My other daughter, though, usually has a harder time figuring out exactly what I want and needs a lot of instruction for poses. Not this time though! I set her in our back yard and just started taking pictures. She tried to copy her sister with the poses she's use to seeing her doing, and then she was just walking around and playing in it. I was surprised how many cute pictures I got of her modeling her owl Scoodie! You can really she how much she loves it in the pictures! If you are interested in the patterns they can be found in my Craftsy store and my Ravelry store!